NOTE: Before you read this article, please read REMEMBER the ALAMO, which sets up the campaign to obtain from the Texas Democratic Party (“TDP”) any records that were the basis for the Certification by TDP Chair, Attorney Boyd Richie: Barack Obama is Constitutionally qualified for the job of POTUS. Because in TX, it was this Certification, submitted to TX state election officials, which persuaded those officials to place Mr. Obama’s name next to the “D” on that state’s general election ballot, a ballot only open to candidates who are eligible for the job. Here is the introduction to the TX Open Government law under which citizens of TX are trying to obtain records from Boyd Richie, Chair, Texas Democratic Party (“TDP”). (All emphasis is mine.) Keep these words in mind as you read the update to those citizen efforts, following. Under the TX open records law, Mr. Richie was obligated to respond to such requests within 10 (ten) business days. (Technically, even assuming he felt he was not obligated under that law to produce the requested records, he still had only 10 days to request, in writing, an opinion from the AG as to whether for reasons listed in the law, he was exempted from producing the requested records. And he had only up to 5 (five) days after that to present any additional arguments to the AG, to inform the decision issuing from that office. 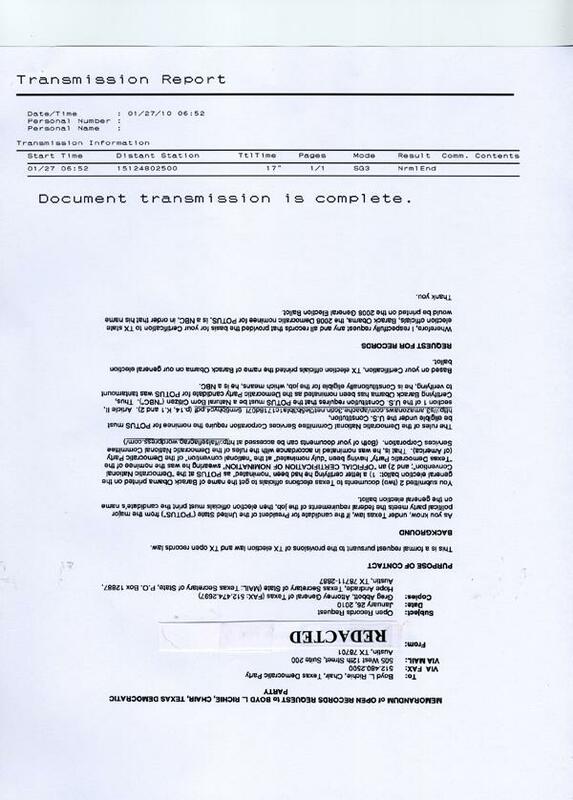 For example, Mr. Richie could assert he is not a “public official” under the law; or that, the documents requested are not “public records”; or that the TDP is not a “political subdivision.”) Before those 10 days expire, Requestors are entitled to either the records requested or, written notice from the Holder of the Records – in this case, this would be Mr. Richie – as to the status of the request for Records, usually in the form of copies of the Request for AG Opinion. Even in a case where Mr. Richie might assert he does not have to present these records because they implicate some rights of a 3rd party, notice of a request for an AG opinion as to whether these records must be produced, must still be copied to the Requestor, appropriately redacted to preserve in advance of such AG decision, the rights, if any, of that 3rd party. Based on the prior refusal of the TDP to produce such records after an informal request, https://jbjd.wordpress.com/2009/08/28/never-less-than-a-treason-2-of-2/#comment-979 I anticipated they would similarly refuse to produce any records after this formal request pursuant to TX open records law. So, I tried to elicit help for ‘my’ Texans, both in writing and by phone, from an organization expressing dedication to the nature of this mission; and located much closer to home. First, I tried to get their attention. On Thursday, February 4, 2010, I submitted this comment to the FOIFT blog site, and awaited a response. 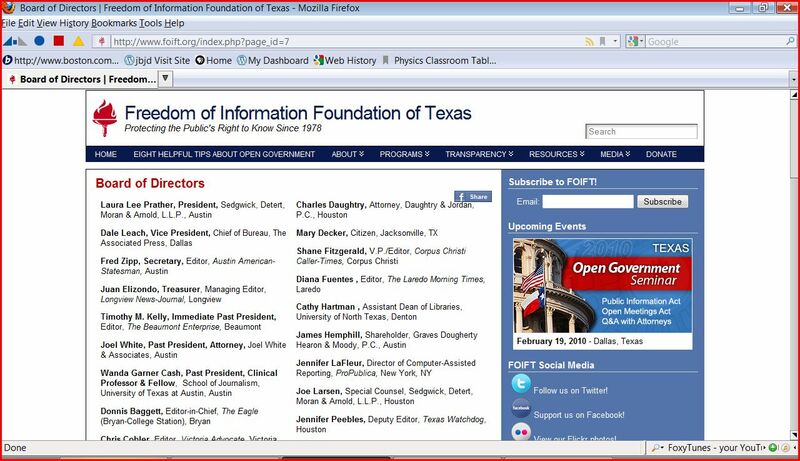 Thank you again for devoting time on Friday to understanding the details of my request for assistance from the Freedom of Information Foundation of Texas (“FOIFT”), which request I extended on behalf of the several citizens of Texas who had filed formal complaints of election fraud with Attorney General Abbott in conjunction with requests for records under the Texas open records law, with Boyd Richie, Chair of the Texas Democratic Party. You confirmed you had read the comment I submitted to the FOIFT web site on Thursday, and had accessed the link to an accompanying article posted on my blog, https://jbjd.wordpress.com/2010/01/26/remember-the-alamo/ which provide the background for these current actions. You also assured me, you took “copious notes” of my narrative, promising to pass on to your Executive Director, Keith Elkins, the information I provided, along with my request on behalf of your fellow Texans, for assistance from your organization. For your convenience, I have summarized the salient points of our lengthy conversation. This groundswell of citizen activism began with an examination of Texas election law, which only allows the names of eligible candidates to appear on the state ballot. In August 2008, Mr. Richie Certified the Nomination of Barack Obama as the Constitutionally eligible candidate for President of the D party in papers he submitted to Texas election officials to cause them to print Mr. Obama’s name next to the D on the general election ballot. Subsequently, citizens asked Mr. Richie, on what documentary basis he had ascertained such eligibility for the job. (I was informed in September 2009 such requests had been made.) He did not respond. Resulting in part on this refusal to identify the basis for his Certification, Texans suspected he had sworn the candidate was eligible without determining beforehand this was true. Consequently, in September 2009, they began filing formal complaints of election fraud with Attorney General Abbott, which complaints detailed the overwhelming circumstantial case that supports their allegations, referencing these unsuccessful efforts to obtain relevant records on their own. Given the stated mission of your organization – “Protecting the Public’s Right to Know” – and your geographic proximity to the petitioners – I am in New England – I hoped that you could provide guidance to your fellow Texans, and that I could send them to you for help. You indicated you would pass on this request to Mr. Elkins. As I said, the time for Mr. Richie’s response is tolling. The 10 (ten) days allowed in the statute for an initial response expire in a few days. I trust your response to my request for help will issue before that time. I hope this summary aids your recollection. Thanks again for all your help. P.S. During our conversation, you asked whether I was saying, Barack Obama was (Constitutionally) ineligible to be President. I replied, his eligibility was outside of the scope of the concerns held by the citizens of Texas engaged in these activities to preserve the sanctity of their ballots. However, I failed to mention, this disclaimer appears in the introduction to the citizen complaints of election fraud. Note: This Complaint takes no position on whether Mr. Obama is a NBC. I also want to point out that, having viewed the FOIFT video in which Mr. Elkins instructs would be seekers of public records, the holder of these records is prohibited by law from asking you why you want these records, or what you intend to do with them ( http://www.foift.org/index.php?p=144 ); I was surprised that you seemed to question my motives for wanting to access these particular records from Mr. Richie. I must tell you, I could easily imagine circumstances under which being hit with that kind of question might have a “chilling” effect on the pursuit of records to which citizens would otherwise be entitled access, under the law. I forwarded a copy of this email to Brian Collister, an Emmy award winning investigative reporter from WOAI TV, San Antonio, who is on FOIFT’s Board of Directors; and left a voicemail message for him at the t.v. station. I never heard from Keith Elkins, Brian Collister, Pamela, or anyone else affiliated with FOIFT. The original comment I had submitted to the FOIFT web site never re-appeared. Using a liberal count of the timetable prescribed by law, by the end of business on Thursday, February 11, 2010, the TDP was required either to produce the records sought by Requestors or to seek an opinion from the AG as to whether these were required to be released. Plus, Requestors should have been notified in writing by the TDP (the Holder of Records) as to the status of these requests . As the deadline approached, we had more work to do. I asked Erica Thunderpaws and redhank to email to me evidence that the fax to Boyd Richie had been sent. Then, on the 10th day, I asked them to telephone the TDP, to ask whether the requested records would be forthcoming. Both redhank and Erica Thunderpaws called the TDP and were referred to Mark Corcoran, Special Assistant to the Chair (Boyd Richie). A summary of those exchanges can be found in the Comments section to REMEMBER the ALAMO. But I want to emphasize a couple of points from those exchanges. First, Mr. Corcoran repeatedly pressed redhank to identify the name of her attorney. And he insisted to Erica Thunderpaws, ‘Our legal counsel advised us, we don’t have to respond (to your request for records), even with a letter informing you, we believe, we don’t have to.’ As I stated in REMEMBER the ALAMO, the web site of the TX AG contains a primer on how citizens can obtain public records under the TX open records law. http://www.oag.state.tx.us/open/requestors.shtml Any citizen could access this information and compose an appropriate request for records. Indeed, any citizen SHOULD be able to access such information. After all, we are talking about legislation passed by state senators and representatives elected by the citizens; signed into law by their elected Governor; and published on a web site paid for by their tax dollars, under the auspices of the person they chose as the chief law enforcement officer of the state. What good is a law ostensibly intended to keep government open to the people, if the only way people can access its provisions is to have the means to hire an attorney! But judging by the tone he used when pressing the one caller to identify her lawyer; and insisting to the other caller that TDP counsel said they don’t have to respond, I suspect Mr. Corcoran was trying to intimidate both callers into backing off of their request for records. Just like Ms. Mayo Clark from the FOIFT, had tried with me. If that was the goal, neither of them was successful. Second, Mr. Corcoran was essentially saying, ‘The TDP has determined we need not comply with that aspect of the law which requires us to obtain waivers from its provision, through the Office of the AG. No; we will consult with our attorneys to determine whether to obey the law.’ It is this hubris which adds insult to the injury of not being able to obtain those records to which citizens have a good faith belief they are legally entitled access in the first place. Now, to get AG Abbott to ask that question. Finally, I want you to know, creating this post, which includes doing the leg work documented herein – research, emails; phone calls; file conversions; and layout and design, for example – has taken over 24 hours. I am compelled to offer my services because I have solutions to some of the unresolved problems that arose during the 2008 election cycle. While I appreciate your many words of thanks, psychic benefits do not pay the rent; and sleep is not the only valuable commodity I have sacrificed in order to resolve these problems. There is no such thing as a ‘free lunch.’ Please, take the work; feed the kitty. This entry was posted on Sunday, February 14th, 2010 at 06:16 and is filed under Uncategorized. You can follow any responses to this entry through the RSS 2.0 feed. You can leave a response, or trackback from your own site. So, let me see if I have this all straight in my head. 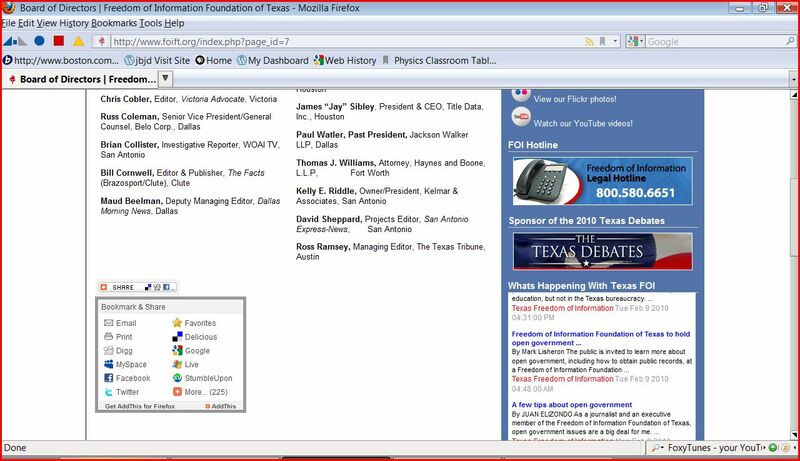 You posted a comment on the Freedom of Information Foundation in Texas new blog. It was then placed in moderation. And then it was removed entirely. How many days was it in moderation before they removed it? When you realized they were not going to post it, you phoned them and spoke to a staffer. Have you learned anything about this person’s background? Is she a D? an R? just curious. No matter, she has yet responded to you and neither has the ED. Right? If not, what kind of outfit is this? How can they possibly boast said mission but not follow it themselves? Are state tax dollars supporting this organization? This smells to high heaven. So, do I have this first part right? P.S. I meant to add, AG Abbott, who has not acknowledged any of the dozens of citizen complaints of election fraud his office has received, is a Republican. jbjd-I just posted on Breitbart.tv 02/14/10 @12:18 re: Scotus decision seemed an appropriate place-I copied the Texas Law part Sec. 552.001 with comments-Texas citizens are submitting Freedom of Information requests. So here is hoping that you get results. I will do more when I find a good point of entry. This was worth waiting for. Happy Valentines Day-your son too. I wonder what he is going to make for his mother. Have fun you two. Hopefully you are not snowed in and/or bone chilling cold. Michelle: Thank you so much for spreading the word, as always, and for appreciating the work. You make up the best summaries for posting! Good work. I’ll spread this over to Zapem. I just did searches on the TX Sec’y of State’s Web site. I have not yet found any current TDP filing record with the TX SoS. All I found was “debtor” records. I kept lots of screen caps and some PDFs from my searches. Interested? I also have an email inquiry under an innocuous email address asking TDP to ID what kind of entity TDP is. Texas Voter: It’s very interesting that you did that; so did I, some time ago. And I, too, was stymied as to the organizational status of the TDP. But under the law, both statutory and common law, the fact that the state of TX authorizes the TDP to Certify the candidate whose name will go on the ballot, satisfies the limited scope of my needs here, to hold them accountable for producing the records. Re: “Mr. Richie formally submitted … 2 (two) Certifications of Nomination” Two certs or two docs? Are copies available? On what document(s) did Richie specifically swear to BHO’s eligibility? Since you take no position in your complaint about BHO’s citizenship status, why limit your complaint’s focus to that issue, instead of all of the Art. 1 Sect. II qualifications? Texas Voter: I am going to make this ‘brief’; let me know if your questions are answered. I heard this quote when I was a little kid and I still love it. If BR took Nancy’s word for it, that wasn’t real smart. re: Tea Party membership. I was/am a Hillary supporter and have become out of necessity a Tea Party person. I don’t think anyone realizes how many of us in the Tea Party are Dems. I love the Tea Party since it is so wild west, within the bounds of the Constitution of course. I like that it is a mix of Dem-Rep-Ind-Unaffiliated and all the folks feel free to express themselves and be heard. There is a lot of common ground, yes there will be differences, but hopefully most will be minor. For most of us it is NOT about money or power it is about love of our Constitution, WE THE PEOPLE, our fellow Americans, justice, fairness. This should be an interesting week. Push is coming to shove. Michelle: You understand, the basis for BR’s Certification is only a means to an end. Because even IF by claiming, he believed BO was eligible because NP said so, he can avoid a criminal charge of election fraud; this still leaves unanswered the question, how did she determine his eligibility? Keep in mind, “THE END GAME” is to get Congress to introduce Articles of Impeachment, and begin the formal investigation. Because they said, they would ratify the vote of the Electors for BO, notwithstanding concerns of eligibility submitted by their constituents, based on a good faith belief in the validity of claims by APFC that, he was born in the U.S.A. (As these citizen complaints point out, APFC never said, BO is a NBC.) The information in these complaints establishes, APFC is not credible. This leaves Congress with no basis to have ratified the EC vote for the man whom their constituents tried to tell them, has never been vetted as to Constitutional eligibility for the job. Great jbjd…dog ’em!! KIck some Texas azz!!! Texan’s sent a letter to the TDP Chairman Boyd Richie requesting documentation he used to confirm Obama’s constitutional eligibility. The TDP had ten business days to respond to said request. Since the TDP is not a government actor and a private corporation, they are under the impression they do not have to abide by the Texan’s request for information. But, they do according to the Texas FOIA law. Do I have my facts straight? When these Texan’s did not receive notice in writing from Richie OR the AG they phoned the TDP. This is when a staff person stated as fact that the TDP did not have to comply with Texas FOIA law. But the state code clearly states that they do? So, given these facts, what do Texan’s need to do now? d2i: You write, “Since the TDP is not a government actor and a private corporation, they are under the impression they do not have to abide by the Texan’s request for information. But, they do according to the Texas FOIA law. Do I have my facts straight?” No. This all reminds me of two dances the Waltz and Dance Macabre. May all the innocent be proven innocent, let the guilty be found out-whoever they may be. Seems like it comes down to Obama, Pelosi and Bauer in the end. Texas Ethics Commission (website, http://www.ethics.state.tx.us) may also receive complaints on violations of the Texas Elections Code. I’ve been exploring the TX Attorney General’s website, especially the section on AG opinions. Some of this information might be useful here. You can subscribe to the AG’s automated email opinion notification service, which I have done. jbjd-As soon as I read this line I thought about you. Notably, freelance authors prevailed in the Second Circuit in a seminal copyright infringement case, Tasini v. New York Times, against newspaper and magazine publishers and Lexis-Nexis. The U.S. Supreme Court affirmed, 7 to 2, holding that the copyrights of freelance writers had been infringed when their work was put online without permission or compensation. He was short and sweet, and if my inner social worker intuition has not failed me in my old age…more than a little aggravated. Alecia: Thank you for re-posting this comment over here. As I said, I wondered what happened to you; and I am impressed, as always, with your contributions. For now, I advise against doing anything, for several reasons, among which are these (in no particular order of import). 1. Whatever factors allowed AG Abbott to ignore the dozens of complaints of election fraud against Boyd Richie already filed with his office beginning several months ago; these factors likely will not make his office any more predisposed to investigating complaints of violations of the TX open records law. You citizens of TX presented a prima facie case of election fraud that merited a response from the AG, where even a simple complaint sans all of that evidence, should have sufficed. 2. Shortly, I will be posting the next article on the blog. In ways I cannot explain now, I anticipate this will recruit helpers from unlikely sources, to get the word out. I want to thankyou for all you are doing to expose the usurper. I live here in East Texas and am willing to help in anyway that I can. I was a County delegate and it was my understanding not too may folks like Boyd Richie. I think he came into power to do this dirty work of signing these false documents. I think this is the real story. If we could uncover this maybe it will be a little easier to get them to hand over the information you are requesting. I have been on the phone all day to the Texas DNC and they answer no questions. Have you tried contacting his asst. His name is Mark Cororan. I have to tell you that I have found that this Richie guy seems to be hooked up some way to the Kennedy’s and the guy that everyone in Texas thought would win the seat was an Ann Richards/Bill Clinton guy. So I feel this was a predetermined person to get this seat to overlook Obama’s lack of verification. Thankyou again for all your work and feel free to contact me if needed for further help. Connie: Welcome to the blog; and you are welcome. Please re-read this article; Mark Corcoran is mentioned prominently. Also, read readers’ comments and my responses. We covered the win/win situation of not getting any documents. Then, back on REMEMBER the ALAMO, read the TX complaint of election fraud, and follow the links. This will explain everything. The next step, after you understand the nature of the fraud and that these requests for documents are a means to the end of augmenting those complaints; download each, fill in your real name and address in TX; and send, as directed. Great and Wonderful and Interesting work you have done in finding Texas laws to compel the TDP to provide a public record regarding the candidate’s qualification as required by Texas law! Good job Erica and Alecia! I found this court case interesting about Tom Delay’s ineligibility in 2006. The court basically found Tom Delay eligible until the day of election as an ‘inhabitant’ even though he claimed residence in Virginia and the people of Texas had voted for him in the primary. The court sided with TDP, the plainiff, in this case. Here’s an excerpt from what Boyd Richie’s attorney stated in their own brief which is also a public record. I know this court case deals with a different part of the Texas Election Code (§ 145.003), but it does also deal with public records of a political party and the eligibility issues of federal candidates with regard to the U.S. Constitution. I find it interesting that Boyd Richie must know the importance of public records of a political party from his own brief as Tina J. Benkiser, chair of the RPT (Republican Party of Texas) used her own public record to defend herself. I suspect Mr. Richie doesn’t have a record(s) to defend himself to ‘conclusively establish’ the candidate’s eligibility. azgo: Nice to see you again! On behalf of Alecia and Erica and redhank, who also did yeowoman’s work to contact relevant parties and obtain the requested documents, we thank you for recognizing our work. I only stumbled onto TX laws, looking for something else. I am certain other states have enacted such laws; and some of those states are also applicable states in which to file complaints of election fraud. But I will not look up these laws. Citizens in those states must assume the responsibility for this part. However, as you know, once they find what they think they are looking for, they can come to me for guidance. Oh ya! Good job redhank, too !!! If both Fed and State govt’s have failed to establish processes to ensure Constitutional eligibility, cannot the people not reserve the right to do so? With that in mind, how can lack of standing prevail in deflecting attempts at discovery thru the courts? Janis: I am unable to post the comment you submitted to “jbjd” for these reasons. 1. The remarks contain a definition of NBC. Posted several times throughout the blog are statements similar to this: No definition of NBC exists until a federal appeals court rules in a case directly on point, this is what NBC means. Your opinions are speculative only, and not based in fact. 2. The remarks contain a prohibition of NBC status based on dual citizenship. The U.S. Constitution is silent as to dual citizenship, either in terms of its impact on eligibility for President or, as such status relates to U.S. citizenship. Your opinions are speculative only, and not based in fact. 3. The remarks express a personal opinion that BO favors Muslims (at the expense of other religions/nationalities). We are an interactive blog of activists citizens trying to understand how our government works; and trying to make it work better. We try hard to ‘stick to the facts,’ engaging in speculation only on the basis of those facts. Special attention is paid to the accuracy of information posted, including making sure it is appropriately cited or, credited to the appropriate author. I try especially hard to refrain from posting any comments containing words or phrases that likely would give any reader the impression, the author is venting a personal animus against a particular group or individual.